The atmospheric CO2 concentration is rising, and models predict that by the end of the century it will have increased to twice the amount seen at any given time during the last 15 million yr. This will cause a decrease in average surface water pH of 0.4, and planktonic protists will be among the organisms to be affected first by this change. We tested whether reduced pH (and increased free CO2) would affect plankton communities over an incubation period of 14 d. In a laboratory microcosm setup using a natural plankton community from the Derwent River estuary, Australia, 2 treatments with reduced pH (8.0 and 7.7) were compared to an unaltered control of pH 8.3. An extreme pH 6.3 was included for comparison. Measured parameters included community photosynthesis, nutrient uptake and biomass build-up as well as enumeration of 25 protist taxa and quantitative HPLC of phytoplankton pigments. A major succession was seen during the 14 d, but no effects at all were found in pH treatments 8.0 and 7.7, whereas the extreme pH 6.3 clearly affected the community for all measured parameters. 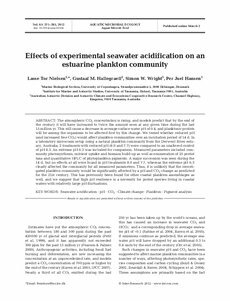 Thus, it is unlikely that the investigated plankton community would be significantly affected by a pH and CO2 change as predicted for the 21st century. This has previously been found for other coastal plankton assemblages as well, and we suggest that high pH resilience is a necessity for protist species living in coastal waters with relatively large pH fluctuations.